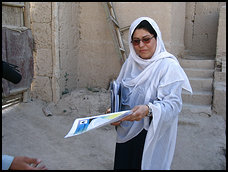 Charkhi, 36, is a journalist based in the capital, Kabul, who is campaigning for a seat in Afghanistan’s new parliament. But in this mud-walled village in Logar, the home province she hopes to represent, Charkhi’s candidacy is such a challenge to tradition that she and her relatives, including her cousin Shah, have faced repeated threats. Charkhi’s situation underscores both the difficulties facing female candidates running for office in the Sept. 18 parliamentary elections and the determination many have expressed as they embark on an unprecedented bid for political power. Even though many Afghan families still prohibit wives and daughters from showing their faces in public, 328 women are running for the lower house of parliament, where 68 of 249 seats have been set aside for female representatives. An additional 237 are running for seats on provincial councils that will in turn appoint a third of the upper house. Despite the traditional restrictions on women, the guaranteed quota of legislative seats for them has given political parties, tribal leaders and powerful families an incentive to promote female candidates whom they might otherwise have ignored—or even banned from running. “There is quite a bit of support for women running in the parliamentary elections—much more than we expected,” noted Rina Amiri, a U.N. political affairs officer who is monitoring the elections. Yet female candidates in provinces across the country have complained of receiving phone calls and letters threatening them with death if they don’t withdraw.